Sir David Attenborough has warned that population growth must be stopped in order to offer a ‘decent life’ for all. The wildlife broadcaster said people were shying away from accepting that the world’s resources cannot sustain current levels of population growth. ‘There cannot be more people on this Earth than can be fed,’ he writes in the New Statesman. Sir David, 84, said the global population is over six billion and will hit nine billion in 30 years, but ‘there seems to be some bizarre taboo around the subject’. He warned of a ‘perfect storm of population growth, climate change and peak oil production’, leading to ‘insecurity in the supply of food, water and energy’. ‘We now realise that the disasters that continue increasingly to afflict the natural world have one element that connects them all – the unprecedented increase in the number of human beings on the planet,’ he added. Sir David said there was a ‘taboo’ tackling the subject and that people shied away from stating the fact that a world’s resources cannot sustain current levels of population growth. He said: ‘There seems to be some bizarre taboo around the subject. This taboo doesn’t just inhibit politicians and civil servants who attend the big conferences. The 84-year-old praised controversial 18th century demographer Thomas Malthus, who argued that populations increase until they are halted by ‘misery and vice’. He added: ‘The population of the world is now growing by 80 million a year. One and a half million a week. A quarter of a million a day. 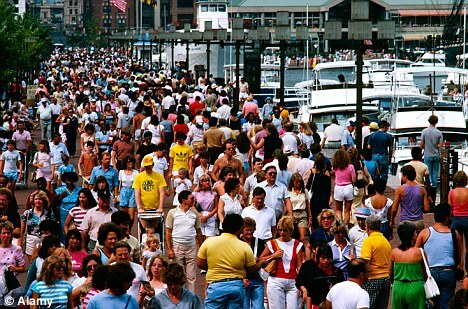 The global population is now in excess of six billion and is predicted to hit nine billion within 30 years. Experts have predicted that the British population – which is currently around 62million – will increase to 70million by 2029. A report by the sustainable development group Forum For The Future said Britain would struggle to handle such growth. The increase in population would be ‘catastrophic’ and put unsustainable pressure on housing, schools and hospitals as well as natural resources. Current trends will see a city the size of Bristol added to the population of the UK every year for the next two decades. Sir David’s comments follow a similar warning from BBC wildlife expert Chris Packham. The Springwatch presenter suggested offering Britons tax breaks to encourage them to have smaller families. 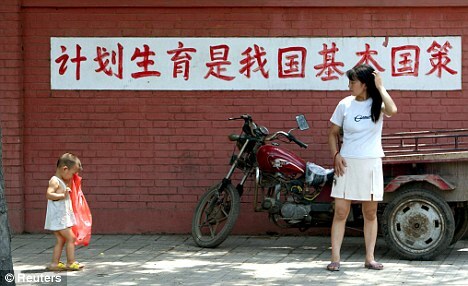 He effectively endorsed China’s controversial one-child policy, which sees couples who adhere to the rule given a lump sum on retirement. But he stopped short of suggesting people should be penalised for having too many children. Packham suggested offering couples a financial incentive as ‘a carrot’ to persuade them to have fewer – or no – children. ‘I question the way, for example, people have two children with one partner, then split up and have two with their next partner, just to even up the score. 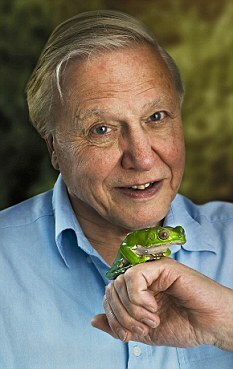 Population growth must stop, says Sir David Attenborough | Mail Online. Nuclear Power is Safe: India to Build the Biggest Reactor Ever ! Funeral procession of Tabrez Sayekar. Authorities responded to peaceful protest of a proposed nuclear power plant site in India by shooting at the crowd, killing one and injuring eight. Over sixty others were arrested. Killed by police on Monday, the body of 30-year-old Tabrez Sayekar was carried through the streets at a funeral march attended by more than 2,000 people on Wednesday. No one has been charged in his murder. The Nuclear Power Corporation of India Limited (NPCIL), along with the French nuclear energy giant, Areva, plan to build the world’s largest nuclear power plant complex generating nearly 10,000 megawatts of electricity in an agricultural area at Jaitapur in the Ratnagiri district of Maharashtra. In December, the world renowned Tata Institute of Social Sciences published a social and environmental assessment of the proposed project conducted by Jamsetji Tata Centre for Disaster Management last April, calling it a potential disaster. According to DNA India, the report charges that the government has hidden and suppressed important and relevant information, and “has subverted facts” by labeling the proposed 968-hectare site as barren land that the locals use for agriculture, horticulture and grazing. ‘Farmers and horticulturists have spent lakhs of rupees to make the land cultivable over years and even the government has supported them. This includes Alfonso mangoes and cashews. Now, when the time has come for them to reap their investments, they are afraid of losing their land as the government now claims it is barren land,’ says the report. It adds that even the fisherfolk of the region are against the project. Even the level of seismicity was changed, from a high severity earthquake zone to moderate seismic severity zone. [T]he Geological Survey of India shows that between 1985 and 2005, there were 92 earthquakes [in the area]. “The ground is unstable, say activists and geologists, and there is no guarantee that the government’s safeguards will protect the people and ecologically sensitive Konkan coast from a nuclear disaster should there be another earthquake. At Shivane village, 20 km from Jaitapur, Chandrakant Padkar remembers the day the earth shook and the road outside his house vanished. The unreported earthquake took place two years ago, and the village still bears the scars. Greenpeace India plans to deliver a petition to the Maharashtra Chief Minister on April 26, the 25th anniversary of the nuclear disaster in Chernobyl, Ukraine. You can sign the petition here. Instead of ignoring and ruthlessly suppressing the protest against the Jaitapur nuclear reactor park, Prithviraj Chavan, Maharashtra Chief Minister, needs to scrap the project. The CM needs to know that he cannot build Jaitapur against the people’s will when alternatives exist. The damage done to Earth by nuclear accidents and waste is permanent, for a mere 20-30 years of electricity, a dirty secret that the nuclear industry has not resolved. In the U.S., for example, the waste is stored in holding pools at four to five times the pool’s capacity. Nuclear plants use 25-50% more water per unit of electricity generated than fossil fuel plants with equivalent cooling systems…. The average US plant operating on an open–loop cooling system withdraws 216 Million litres of water every day and consumes 125 Million litres of water every day. “Nuclear plants and uranium mining also contaminate water and the methods used to draw the water and exclude debris through screens kill marine and riparian life, setting in place a destructive chain of events for ocean/river systems. Der Spiegel writes, “The Chernobyl Exclusion Zone, for all the attention it gets, is far from the only nuclear no-go area on the planet.” In its recent catalogue of several now-uninhabitable spots on the planet as a result of nuclear use, leaks, waste and accidents, Spiegel documents thousands of square miles in the U.S., Germany, Kazakhstan, Japan, India, Britain and Northern Africa contaminated by radiation, areas which produce high rates of birth defects and cancers. Their report doesn’t even touch the depleted uranium used in the Middle East by the U.S. and its allies. While we watch Fukushima’s radiation fall on the northern hemisphere, contaminating our milk and water in the U.S., Canada and Europe, it’s notable that, like previous nuclear accidents, governments lie about the severity. Fifty years after the UK’s worst nuclear disaster, experts advise that the radiation released was twice what was originally reported. Consequences of the Catastrophe for People and the Environment, the authors conclude that, based on now available medical data, 985,000 people died as a result of the Chernobyl disaster, as of 2004. The researchers based their conclusions on 5,000 radiological surveys, scientific reports and health data. Because of the Fukushima nuclear meltdown, EnviroVideo released a video based on that book: “Chernobyl: A Million Casualties.” Watch it at http://blip.tv/file/4922080. The film will air nationally on Free Speech TV (freespeech.org) on April 23rd. Corporate-run governments will not stop destroying the planet for profit. It is up to humanity to do all in its power to end the ongoing ecocide. Sometimes this means putting your life on the line, as Tabrez Sayekar did on Monday, just short of the 25th Anniversary of the Chernobyl nuclear disaster. A version of this article first appeared at Global Research. Posted in India Forgotten, Pollution | Tagged: Areva, Geological Survey of India, Government of India, India, Jaitapur, Nuclear power, Nuclear Power Corporation of India, Nuclear Power Corporation of India Limited, Tata Institute of Social Sciences | Comments Off on Nuclear Power is Safe: India to Build the Biggest Reactor Ever ! AMSTERDAM (Reuters) – Rules designed to spare the world’s taxpayers from paying for a future financial crisis could also make it more difficult to build and replace infrastructure such as the roads they drive on. The rules, known as Basel III, will weigh on the ability of banks to provide project finance loans on which cash-strapped governments and developers of power plants, pipelines and renewable energy such as wind farms rely to fund schemes. “Banks have been the stalwart of privately financed projects. If long-term lending requires more capital to back it, it affects the enthusiasm of banks to provide it,” said Andrew Davison, senior vice president at credit rating agency Moody’s. In Europe, this will hamper efforts to attract private funds into transport, energy and communication networks that are key to economic growth as well as providing jobs at a time when many European countries are struggling with unemployment. Construction accounts for 7.1 percent of Europe`s total employment, according to the European Construction Industry Federation. The European Union (EU) says Europe’s infrastructure investment needs to 2020 could be up to 2 trillion euros. Project finance loans are also big business for banks, having grown from a $110.8 billion global industry in 2000 to $208.1 billion in 2010, according to data compiled by Thomson Reuters Project Finance International. This rise, driven by the private sector’s increasing participation in the funding of infrastructure, is at risk under Basel III, which will make project finance loans scarcer and more expensive due to the way they are accounted for. “There is an expectation that the volume of project finance loans will drop very significantly over the coming years under Basel III,” said Timothy Stone, chairman of the global infrastructure and projects group at accounting firm KPMG. Under Basel III, a short-term liquidity buffer, known as the liquidity coverage ratio, will include liquid forms of debt such as government bonds and top-notch corporate paper, but not project finance loans, seen as among the most illiquid. A second ratio, the net stable funding ratio, makes the provision of long-term debt such as project finance more expensive for banks by requiring them to match their liabilities with their assets in terms of funding. While not all banks will abandon project finance as a result, their business will be severely affected, said Noburu Kato, EMEA head of structured finance at Sumitomo Mitsui Banking Corporation. “I believe project finance by banks will continue because there is an increasing need for it, from governments that need to invest in infrastructure and companies that do not want to use their balance sheet. But costs will increase,” Kato said. Although Basel III is to be implemented between 2013 and 2018, bankers say the impact on project finance will be felt before the rules kick in as banks compete to show investors they are well positioned for the new capital requirements. “I would expect most of the impact of Basel III on project finance to be priced in by 2014,” said KPMG’s Stone. In the European Union (EU), project finance accounts for slightly less than ten percent of total infrastructure finance, according to a 2010 European Investment Bank study. The European Commission is exploring initiatives such as backing project bonds to compensate for any drop in project finance loans. Bonds made up only 9 percent of global project finance activity in 2010 according to Project Finance International. The market for project bonds suffered after the woes of monolines — companies that insure bonds — in the credit crisis of 2007. But some financiers see opportunities to create new instruments to replace the monolines that can lift a project bond’s credit rating from the BBB range into the A category, attracting a wide poll of institutional investors. Such a market is still in its infancy but has the potential to fill the gap left by the Basel III-hit project finance industry, its advocates say. Last year, British insurer Aviva partnered with Hadrian’s Wall Capital, an advisory firm, to create a debt fund dedicated to such instruments. “Our form of credit enhancement can help the project finance bond market take off. We are looking to raise approximately 1 billion pounds with our fund and with that we should be able to provide around 10 billion pounds in financing,” said Hadrian’s Wall Capital Chief Executive Marc Bajer. Basel II requirements and their strict compliance has protected the major banks and financial institutions worldwide.International Bank for Settlement (IBS) is doing a remarkablec job by way of stipulating the necessary capital requirements ina very prudent manner.The developing countries ,in the initial years might have faced the difficulties in its implementation but results are praiseworthy. The stringent measures must go on and Basel III is a welcome step. Infrastructure projects and other long term investments would require higher capital requirements but for maintaining the robust health of the banks it is needed.The Central banking system of each country would take necessary steps to augument their caital is these activities have to be pushed in a big way.Not only this, there is a long time gap in implementation and during this period, each institution is needed to take strong steps to boost their capital needs to cater the needs of these sectors.As such, there should be any apprehension that development process would suffer dur to Basel III.Robustness of the financial institutions is to be maintained. In India, the regulatory framework is so strong which has given a big support to the banks in comliance matters, governance and reporting system.The RBI has shown the path to other countries,Regulatory bodies and central banks that how to grow even in difficult times alongwith maintaining strong standards of compliance.